Group physical training program conducted by gyms, personal trainers, and former military personnel. These programs are designed to build strength and fitness through a variety of intense group intervals over a 1-hour period of time. Fusion International music/dance themes that create a dynamic, exciting, and based on the principle that a workout should be “FUN AND EASY TO DO.” The routines feature aerobic/fitness interval training with a combination of fast and slow rhythms that tone and sculpt the body. Energizing music with dance steps taught in a progressive format, creating a fun and exciting class for all levels. The routines feature aerobic/fitness interval training with a combination of fast and slow rhythms that tone and sculpt the body. Training done in intervals, involving a series of low- to high-intensity workouts interspersed with rest or relief periods. The high-intensity periods are typically at or close to anaerobic exercise, while the recovery periods involve activity of lower intensity. It involves a series of movements performed in a slow, focused manner and accompanied by deep breathing. It is a noncompetitive, self-paced system of gentle physical exercise and stretching. Each posture flows into the next without pause, ensuring that your body is in constant motion. 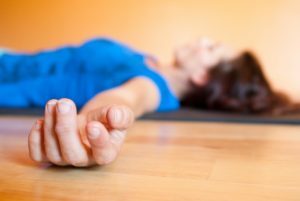 Yin Yoga is a quiet practice suitable for all levels which restores the natural loosening and lubrication of deep connective tissues that are often difficult to reach. 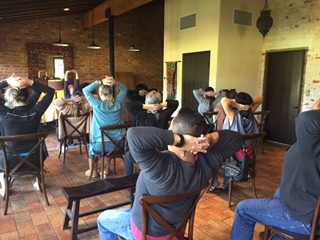 Our certified Wellness Educators will guide participants into holding gentle poses for 3-7 minutes, allowing the release of connective tissues by gradually relaxing further into each pose. The entire session is performed while seated or lying down, with movement focused on promoting release primarily in the pelvic region. Loosening the tendons, muscles, and connective tissues that reside deep inside the entire pelvis, promotes a calm mental state and a light and free physical state, ideally suited as a “wind down” session. Chair Yoga allows the enjoyment of being able to access the muscles, tendons, and tissues of the body that may not otherwise be accessible to those with limited mobility and/or injury. 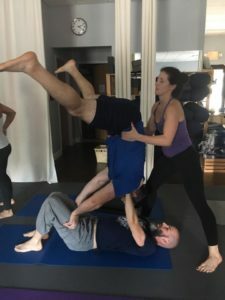 Utilizing the chair as a tool to overcome common physical limitations, this session is perfect for those who have challenges with the traditional yoga movements. Wellness Educators guide participants through safe and effective movements that allow participants to enjoy the benefits of increased circulation, balance, flexibility, mobility, strength, and mental clarity that yoga brings. These Introductory Team-building sessions promote symbiotic partnerships that create benefit for both participants. 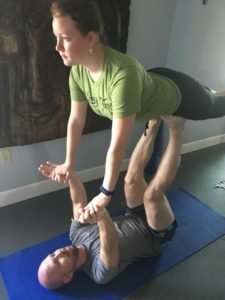 Upon request, basic acro yoga may be included, using a base (person that creates support) and a flier (person who uses the support of base to practice movements and poses). 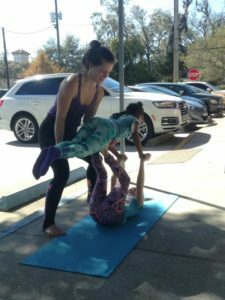 Partner yoga elevates the symbiotic relationship between each team of partners through movement, connection, and play. 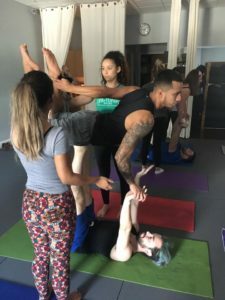 The experience of partner/acro Yoga that promotes release of fear and deepens relational trust, invites practitioners to tap into new and infinite possibilities of communication, trust, and union. 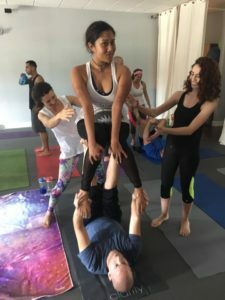 By combining acrobatics, yoga, and healing arts, this session is excellent for any corporate or convention team-building experience. 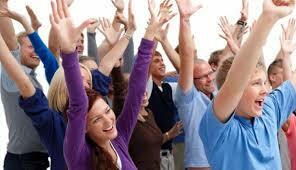 Laughter Yoga is a global phenomenon being practised successfully in more than 100 countries. It is a powerful tool that helps reduce workplace stress and creates a happy and energetic workforce. Developed by Indian physician, Dr. Madan Kataria in 1995, it is a breakthrough laughter delivery system where anyone can laugh, and practice laughter as a group exercise, without relying on humor, jokes or comedy. Scientific studies have shown the power that body language has on our mental state. Choosing laughter promotes a positive outlook and invigorated mental state of being. Laughter yoga is highly recommended to lighten the mood, making this a wonderful practice for an upbeat, happy, and energized work environment. 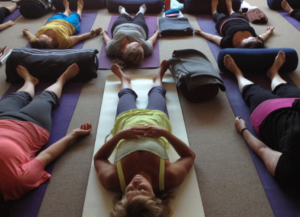 Yin Yoga is a quiet practice that restores the natural loosening and lubrication of connective tissues that are often difficult to access. 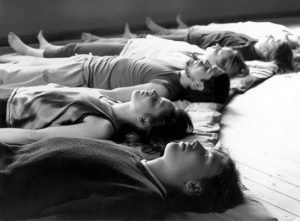 This opening promotes deep release and relaxation in both body and mind. See a full description in the yin yoga tab above. 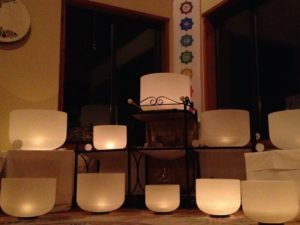 Crystal bowls (also known as Tibetan Singing Bowls, rin gongs, Himalayan bowls or suzu gongs) use the resonance of the bowls’ harmonic vibrations within the human body to balance and relax the body’s subtle energy centers. Crystal bowls sit with the bottom surface resting, while the rim vibrates frequencies whose resonance enhances mental and physical balance. 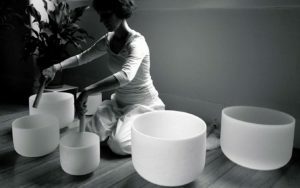 Singing bowls are used worldwide for meditation, music, relaxation, and personal well-being. Historically made throughout Asia, especially Nepal, China and Japan, they are still used commonly today by holistic practitioners, as they offer a powerful assistance to holistic health. The peaceful harmonies they produce promote a calm mental state combined with deep peace and clarity of mind.